What Makes A German Rottweiler...... German? In order to be considered German, a German Rottweiler has to be born in Germany, or have parents who are German born with ADRK (Allgemeiner Deutscher Rottweiler Klub) registration papers. But of course, it's not that easy and this is just the beginning of the story. Given the above statement, then all other Rottweilers born across the world are also 'citizens' of their country of birth, but this doesn't explain why German Rottweilers are considered to be superior. To fully understand that part, consider a puppy's pedigree as the document that determines the quality of that puppy. A pedigree shows a puppy's bloodlines (or ancestors) - think of it as your pup's 'Family Tree'. The quality of the dogs in your puppy's pedigree directly affect the quality of your pup, both in terms of looks ('conformation'), temperament and health. THIS is where the superior quality of German Rottweilers is found. If your puppy was born in New York for example, he is by definition an American Rottweiler (by birth). But that isn't what determines the size of his head, the quality of his hips, or the type of temperament he has. His bloodlines do that. If his Sire and Dam are German born and ADRK registered, the chances of your puppy being an excellent representative of the breed are very high - regardless of which country he was born in. But why is a German Rottweiler so much better than an American (or British, Belgian, Australian etc.) Rottweiler? Why is having German-born dogs in your pup's pedigree so important? The answer to that lies with the ADRK in Germany. 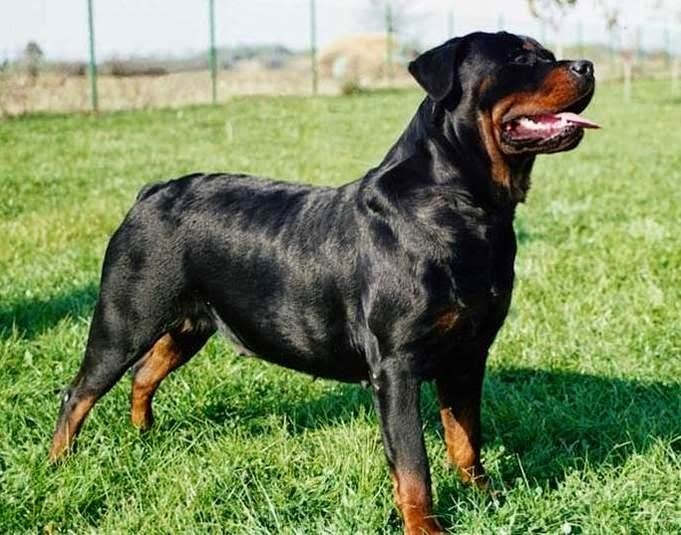 The ADRK is basically the German breed club for the Rottweiler (the 'parent breed club' you could say), and it's main goal is to protect the Rottweiler breed. This is an still a very important point today. Always remember that although your little guy or girl may be destined for a life of luxury, as a much-loved family companion, the Rottweiler is a working breed. Rottweilers shouldn't just look like Rottweilers, they should act and move like Rottweilers too, and have the ability to perform the tasks/duties that the breed was originally designed for. When you say look like a Rottweiler, does that mean the cropped tail also? Many people say to leave it long and I try to explain that a cropped tail IS the rottie's breed! Rottweilers are born with a tail. The cropping of the tail is man made and can therefor not be in their breed. Some Australian shepherds are born without tail so it can be considered as being in their breed, but for a Rottweiler never.